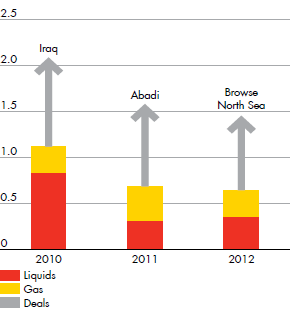 Since 2008, Shell has acquired exploration rights to some 400,000 square kilometres. 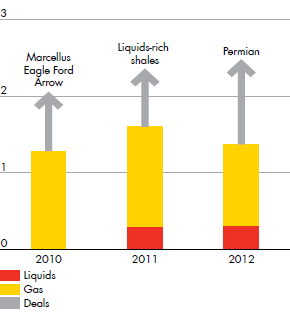 In 2012, we secured rights to more than 120,000 square kilometres, including positions in liquids-rich shales. Recent significant additions are specified below. In February 2012, Shell signed a farm-in agreement and a joint operating agreement (JOA) with Petromanas to acquire a 50% working interest in Blocks 2 and 3. In July 2012, Shell Australia was awarded the W11-2 permit located in the Browse Basin offshore north-west Australia. 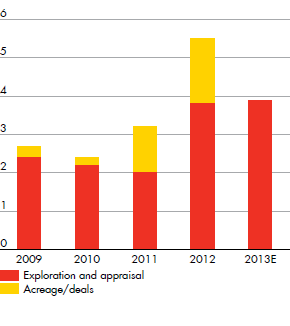 The new acreage, awarded as Shell 100% equity, contains multiple prospects. This position adds to Shell’s operated footprint offshore north-west Australia. In August 2012, Shell signed two farm-in agreements for the acquisition of a 35% participating interest in Benin Block 4 from Petrobras (15%) and Compagnie Béninoise des Hydrocarbures (20%). In September 2012, Shell signed a petroleum mining agreement, with Shell Deepwater Borneo as operator with an interest of 53.9%, and Petroleum Brunei holding a 46.1% interest. The signing of this new petroleum mining agreement marks a further commitment by Shell to continue to explore and develop Brunei’s hydrocarbon resources. During 2012, Shell Canada was the successful bidder for four large exploration blocks in deep-water Nova Scotia covering more than 14,000 square kilometres and focusing on a newly-recognised oil play. Shell Canada was also the successful bidder for five parcels in the deep-water Laurentian Basin as well as two parcels in the Sable Basin. In addition, several liquids-rich shale assets were accessed in the Nordegg, Duvernay, Canol and Muskwa plays. In Groundbirch, Shell Canada added additional dry gas resources. In January 2012, Shell signed a binding memorandum of understanding with Ivanhoe Energy to buy its 90% participating interest in the Zitong block in the Sichuan Basin, located directly north of Shell’s JQ block. A joint study agreement was also finalised and signed by Sinopec and Shell in June, covering two exploration blocks (XeX1 and 2) in western Hubai Province targeting the Silurian Longmaxi Shale. In July, Shell signed two production-sharing contracts (PSCs) for offshore blocks 62/02 and 62/17 in the Yinggehai Basin. Shell also accessed the shallower prospect above the Zitong/Fushun prolific liquids-rich shale play in the Jurassic Daanzhai Formation, which covers a large area in the Central and Northern Sichuan basin. In October 2012, Shell was the successful bidder for the deep-water block COL-3, located directly south-west of Shell’s GUA-3 TEA block. In July 2012, an assignment deed was signed by the government of Guyana, ExxonMobil and Shell that formalised an increase in Shell’s stake in the Stabroek permit from a 25% to a 50% working interest. In March 2012, Shell signed PSCs for deep-water Block 2B and Block SK318, and in September, Shell signed a PSC with Petronas (50%) for Block SK319. These three new exploration licences offshore Sarawak, together with Block SK408, amount to just under 10,000 square kilometres of new acreage, expanding Shell’s heartland and enabling further exploration in the Luconia/North Luconia provinces. Offshore Sabah, Shell signed a PSC to access Block SB311 with a non-operated position. In December 2012, Shell Great South Basin Ltd (operator) and partners were awarded the exploration licence for block 12GS2 in the Great South Basin. The permit area lies directly east of Shell’s PEP50119 block. In May 2012, a second block was acquired by Shell in the Timan Pechora basin. Shell also won the Arkatoisky block, covering 1,500 square kilometres in the Yamalo-Nenets Autonomous Okrug in West Siberia, in an auction held in October. It is Shell’s first exploration block in this region of Siberia. In December, Shell successfully bid for the Lenzitsky block in the West Siberian Yamal-Nenets region. In February 2012, Shell signed the exploration right agreement, launching the first three-year period of exploration in the deep-water Orange Basin off the west coast of South Africa. 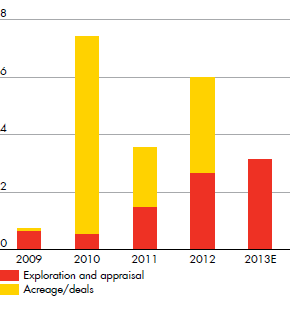 In June 2012, Shell farmed in to Petrobras’ deep-water Block 8 with a non-operating 50% share. In August 2012, the Ukrainian government selected a partnership including ExxonMobil (operator), Shell (35% equity), OMV Petrom and NAK as winner of the production-sharing agreement tender for the Skifska block in deep water in the Black Sea. In May, Shell was awarded the Yuzivska licence covering almost 8,000 square kilometres of shale gas acreage in the prospective Dnieper-Donetsk basin. Shell acquired additional liquids-rich shale and shale-gas acreage in Appalachia, in the Permian Basin, and in the Niobrara, Mississippi Lime, and Wolcamp plays. Shell also accessed Gulf of Mexico sale blocks in Lease Sale 218 and 216/222 in the Gulf of Mexico. Shell was the successful bidder for 27 deep-water blocks.